Suriname should adopt national legislation to restrict the use of firearms by law enforcement officials as international law requires. Police use of a firearm is only permissible where necessary to confront an imminent threat of death or serious injury or a grave and proximate threat to life. Everyone has the right to life. This right shall be protected by the law. Article 9 prohibits torture and degrading or inhumane treatment or punishment. The Suriname Police Force (Korps Politie Suriname, KPS) is the primary law enforcement agency in Suriname. The use of force is regulated in the 1971 Police Charter. 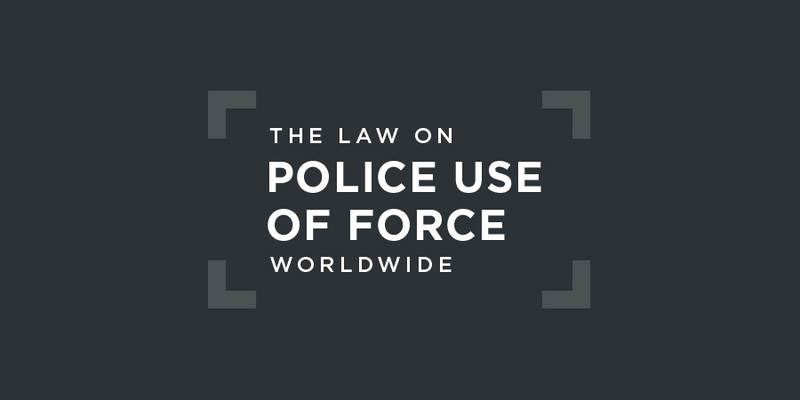 Article 12(1) allows use to be used in the event of unwillingness to comply with a lawful police order or where there is an apparent intent to use force against the police. Under paragraph 2, the police may only use force for self-defence or defence of others; to disperse assemblies; to arrest convicted fugitives or persons who are suspected of having committed a serious crime. Only proportionate force should be used; and no more pain or injury should be inflicted than is unavoidable in the circumstances. Suriname has no dedicated independent civilian police oversight body. All filed complaints of ill-treatment of custodians and detainees against law enforcement officials are investigated by the Personnel Investigation Department, a unit within the law enforcement system. Between 2009 and 2013, there have been some cases of excessive violence committed by police officials against civilians. These police officials were prosecuted and punished after criminal investigations. In 2008, three policemen fired shots in the direction of a mango tree, where a man was stealing mangos. Despite reminders he did not came out of the tree and he got hit by one of the shots. The three policemen were in police custody and prosecuted. In 2012, there was a case where a bystander was fatally shot by an aspirant police officer when firing a warning shot. He was trying to carry off a civilian, who was attacked by an aggressive mob. The police officials, who tried to carry away and protect the civilian, were also attacked and the aforementioned recruit was beaten on the head on the head. The entire incident was filmed by the press and was caught on tape by the security cameras. The aspirant police officer is prosecuted based on culpable homicide and acquitted by the court. At the moment two police officers are tried in a very serious case, in which they abused their duties and unlawfully arrested a man. At the arrest they stole his jewelry and the next day this man was found dead at the roadside, shot several times in the head. They have been charged with murder. This case concerned unlawful use of force by the Suriname army. On 29 November 1986, a unit of the National Army of Suriname surrounded the N’djuka maroon village of Moiwana and then killed at least 39 members of the community. Many others were wounded and they, together with the other survivors, were forced to flee through the forest until they reached safety in French Guyana. For some this was a three to four day walk carrying wounded family members. In 1989, the civilian police attempted to investigate the massacre. Two persons were arrested in April 1989, but were released when an armed unit of the Military Police surrounded the police station and forced the civilian police to hand them over. Threats were made against Police Inspector Gooding. In August 1990, Inspector Gooding was shot and his body left beside the road near the office of the then-deputy commander of the Military police. The officers assisting Inspector Gooding fled the country and were granted political asylum in The Netherlands. understood that the events that occurred in 1986 gave rise to the obligation to investigate them, and that this obligation was pending execution when the Court acquired jurisdiction to try the State of Suriname and, thus, ratione temporis, it came within the Court’s jurisdiction.